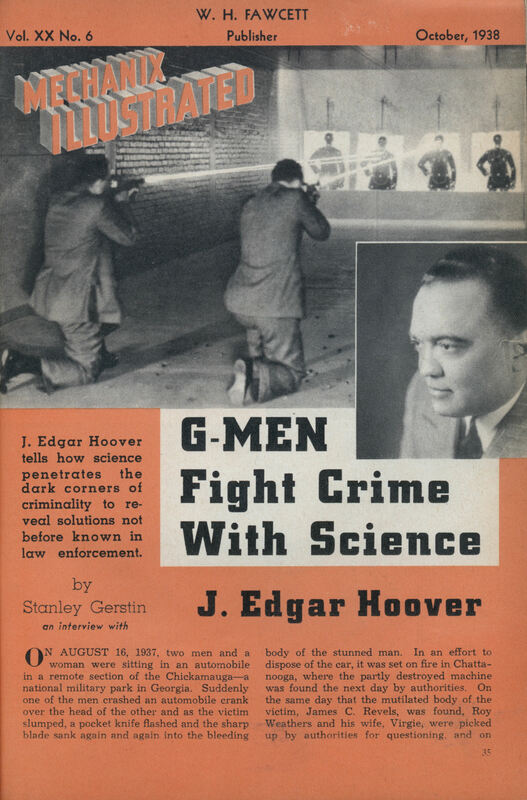 J. Edgar Hoover tells how science penetrates the dark corners of criminality to reveal solutions not before known in law enforcement. ON AUGUST 16, 1937, two men and a woman were sitting in an automobile in a remote section of the Chickamauga â€” a national military park in Georgia. Suddenly one of the men crashed an automobile crank over the head of the other and as the victim slumped, a pocket knife flashed and the sharp blade sank again and again into the bleeding body of the stunned man. In an effort to dispose of the car, it was set on fire in Chattanooga, where the partly destroyed machine was found the next day by authorities. On the same day that the mutilated body of the victim, James C. Revels, was found, Roy Weathers and his wife. Virgie, were picked up by authorities for questioning, and on August 21, they admitted the crime which they later repudiated in part. In the subsequent investigation conducted by the Federal Bureau of Investigation, the Bureau’s crime laboratory established that soil picked up at the scene of the murder contained human blood. The clothing of the defendants and the automobile crank were also shown to contain blood and the pocket knife fitted rents in the victim’s clothing. Minute bloodstains were found on parts of the automobile, in spite of its burned condition, and this evidence resulted in the conviction of the defendants. This murder was solved, in the crime laboratory of the Federal Bureau of Investigation, in Washington, where scientists are performing feats which would startle the imagination of a Sherlock Holmes. With microscope, ultraviolet lamp, test tubes, spectrograph, refractometer and parallel light rays, science tracks down America’s most vicious criminals. Bloodstains, human hairs, scrapings from under fingernails, burnt letters and threads of cloth tell tales of the dead to scientists trained in crime detection. No examination is too complicated for the G-Men of science, who last year alone made nearly 7,000 examinations involving over 33,000 specimens of evidence. 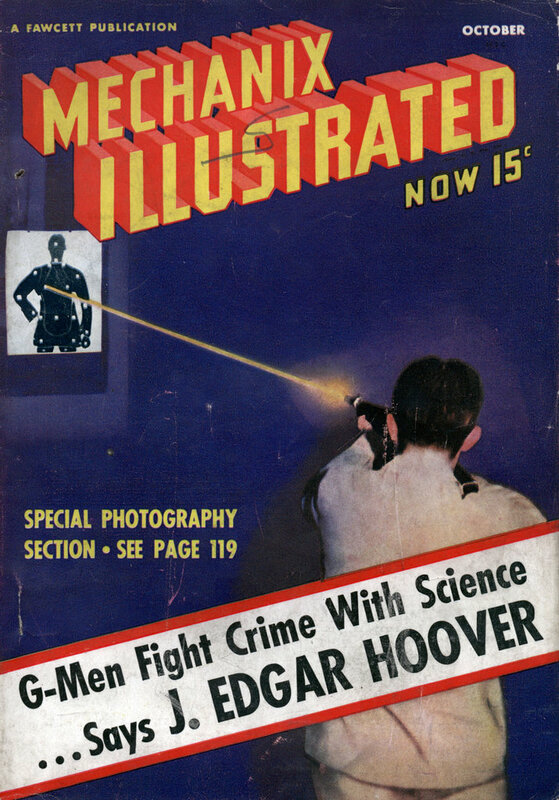 On the FBI’s scientific staff are men engaged in the work of document identification and firearm examination. Others are experts in geology and metallography, particularly as they relate to soil analysis and the examination of metallic instruments from which identifying numbers have been removed. Problems relating to sound, radio and electricity are handled by qualified technicians. A reference collection of rope and cord and specimens of hair and fibres, as well as equipment for making moulage or plaster records. A few years ago, when a prospector was found slain in a remote part of Alaska, the evidence in the case was taken by dog team across snow-covered wasteland and then flown to Fairbanks by plane. From there it was forwarded to Washington. This evidence showed that two persons were suspected. One was an ex-convict who was found leaving the area of the crime with a gun. He had blood on his clothes. The other was an Eskimo boy, also found in the neighborhood with a gun. At Washington the science laboratory examined the garments for human blood and the rifles for camparison with the murder bullet. Upon completion of the examination, word was sent to Alaska that the ex-convict was innocent and the blood found on his garments was that of an animal, as he claimed; but the bullet taken from the victim carried the same markings as a bullet fired from the gun of the Eskimo, and when confronted with the evidence, the boy admitted his guilt. A comparison in the G-Men’s laboratory showed the two bullets to have identical markings. How the microscope and chemical analysis helped solve a crime that occurred April 5, 1936 in Jacksonville, Fla., was revealed when the Florida state attorney called at the FBI’s technical laboratory with evidence relating to the mysterious and brutal murders of Kate Powell and Lou Speer. They were killed in their home and the bodies were carted to the outskirts of the city and dumped in the river. During the course of the investigation bits of charred material were found near the river bank, indicating that someone had tried to burn clothing. A partially burned coat was found to be of the same material in a suit for-merly owned by Marcus Powell, the husband of one of the victims. Several fragments of a pillow case and a piece of toweling used to gag one of the victims were also found in the region. The staff of the crime laboratory found that a comparison of the charred coat material with the pants and vest of a suit belonging to Marcus Powell revealed the material to be identical. To effect this identification it was necessary to burn some of the uncharred material in an electric muffle furnace in order to produce in the known specimens fire conditions similar to that of the questioned material. A microscopic examination of the vest revealed minute blood particles. The toweling used for gagging the victim was found to be the same material as the kitchen towels in the Powell home. Microscopic examination of the unknown material showed that they consisted of bits of a cotton blanket and portions of a rug. The case against Marcus Powell, a former convict who- had been twice before tried for murder, grew and eventually resulted in his conviction. Among the technical equipment used by the crime laboratory in its war against public enemies is the parallel light ray, designed to reveal markings on paper and other surfaces ordinarily not visible to the naked eye. This machine is used frequently in studying ransom notes and writing pads from which ransom-note paper is alleged to have been taken. An example of its practical application was in the Dr. J. C. B. Davis kidnaping at Willow Springs, Mo. The doctor was kidnaped and held for $5,000 ransom and a note identified to be in his own handwriting gave instructions when and where the money was to be paid. G-Men were notified and within a few hours a staff of investigators arrived in Willow Springs and a temporary laboratory was set up. The paper on which the ransom note was written-could not be identified and a search of all stores within 50 miles of the kidnaping failed to reveal paper of similar characteristics. Seven days after Dr. Davis had disappeared, a suspect was picked up and a search of his belongings revealed paper of the same type as that on which the ransom note was written. This suspicion was verified by laboratory examination, which also revealed that markings corresponding to writing on the ransom note were impressed on a blank sheet of the writing pad found on Kenyon, the suspect. The identification was completed when the markings were read under parallel light rays. In the meantime, another ransom note was received demanding the $5,000 payment. Shortly thereafter G-Men found the body of Dr. Davis in an open corn field twelve miles from his office. He had been shot three times with a .25 calibre gun. Such a gun was found on Ken-yon and markings on bullets fired from it corresponded to markings on bullets taken from the dead doctor’s body when viewed under the comparison microscope. In the home of Kenyon’s sister was found a paper pad corresponding to the paper used in writing the second ransom note and on a sheet of this paper was found indented writing corresponding to the exact wording of the second note. Handwriting experts testified that Kenyon’s was the hand that wrote the second note, which was mailed before he was arrested. At the trial, transparent photographs revealed that the indented writing found on the blank paper corresponded to the third page of the ransom note. Transparencies also showed that the indented writing on the pad in Kenyon’s sister’s home were of his handwriting, and the same as the second note. Laboratory experts revealed that the bullets that killed Dr. Davis were fired from Kenyon’s .25 calibre Colt revolver found in his possessionâ€”and his conviction resulted. Although handwriting, paper analysis and bullet examinations play a large role in the work of the crime laboratory, clever technicians perform uncanny examinations involving bits of thread, cord and wire. Many crime cases are solved by the relatively conventional process of bullet comparisons or bloodstain analysis, but frequently cases occur in which the entire resources of science are brought into play. One such case was that involving John Magnuson, arrested for murder committed by sending a bomb through the mail. The package exploded when it was opened and killed the wife of the addressee. Experts testified that the handwriting on the package was Magnuson’s. Microscopic examination showed that the address was written by a pen having a round point similar to the pen of Magnuson’s daughter’s and the ink in the pen gave the same reactions to chemicals as the ink used in addressing the package. Glue used to seal the package was the same as glue in Magnuson’s possession. The wood covering the bomb was identified as white elm. Microscopic examination of the sawdust residue in Magnuson’s workroom indicated white elm residue as well as hemlock and oak. This proved important because the defend-ent claimed he never used elm. Another expert analyzed the metal in the trigger of the bomb and compared it with metal from a gas engine found in Magnuson’s home. By analysis and with the aid of photomicrographs, metallurgists identified the metal in the trigger as being identical in crystalline formation as metal taken from the gas engine. This was significant, as it was testified by experts that no two metals are identical in formation unless made in the same batch of 100 pounds each. Photomicrographs were produced showing the matched edges of two pieces of metal, one from the bomb and the other from the engine. On the basis of this over-whelming evidence, Magnuson was found guilty. In all cases investigated by the FBI, science takes up where human limitations leave off. No longer can a man obliterate identification numbers from metal by cutting them out, for the crime laboratory men know that the act of stamping a number on metal disturbs its crystalline composition and by means of special instruments, obliterated numbers can be read simply by studying the disturbed formation of the metal. The X-ray machine and ultra-violet lamp as well as the parallel light beams all serve to bring to light invisible evidence that the unsuspecting, unscientific criminal leaves behind him. The crime laboratory’s analysis of physical evidence would astound the cringing criminal who is finding more and more that a technician with a microscope can foil his best laid plans. The use of physical science occasionally takes on a more violent form. Such was the case with the Dillinger gang. Three special agents of the FBI were killed by the thrice-paroled “Baby Face” Nelson, a member of the gang, before he himself was killed in a terrific gun battle with G-Men in Illinois. This same fate was Dillinger’s when he attempted to shoot his way out of a G-Man trap. John Dillinger found out much to his distress that fingertips cannot be changed. In spite of the painful operation which he underwent to change his fingerprints, G-Men established 324 points of identification between his new and old fingerprints! No longer can a criminal plant a fingerprint and get away with it, nor by trying to erase identification of the victim. Skilled scientists working in the crime laboratory with moulage and plaster are able to reconstruct, by a study of the bone formations, any part of the human body â€”hands, feet or faceâ€”for identification and have succeeded in doing so in a number of important cases. Even the most fleeting descriptions of the alleged suspect is sufficient to enable G-Men to compose a picture of the wanted man. This was excellently demonstrated in the Lindbergh baby kidnaping of March 1, 1932. J. F. (Jafsie) Condon had tossed $50,000 over the wall in St. Raymond’s Cemetery in the Bronx, N. Y., and in doing so, he caught a glimpse of the alleged criminal. From his description, G-Men artists were able to draw a portrait of the wanted man. In the files of the FBI in Washington, a picture of Richard Bruno Hauptmann, executed for the kidnaping in 1936, hangs side by side with the artist’s drawing of the man purported to have received the money in the Bronx cemeteryâ€”and the likeness is startling.